Slim fit with a mid-thigh length for added coverage and warmth. Eco-friendly construction in the form of recycled down and fabric. Insulation 600-fill recycled down. MICHAEL Michael Kors Womens black Long Down Quilted Hooded Puffer Coat Jacket s. Condition is Pre-owned. Shipped with USPS Priority Mail. Insulation: high-fill goose down. Was washed again and is a little fluffier but not like the orange one. Waterproof and warm. See all photos. Ready to wear. Machine wash cold, tumble dry low. Embroidered logo at left chest and back right shoulder. Extra warm down coat, great for the coldest of climates. The temperatures were below 0 and I never felt cold in this coat. Filling: 70% Down/30% Feather. Label indicates size S/P, but fits US size 8 or 10. LARRY LEVINE DOWN COAT. quilted design. snap button closure. DOWN 430 Fill Power. This Longer-Length Down-Filled Hooded Jacket Is A Smart Choice In Colder Conditions. The Surprisingly Sleek Profile Conceals Highly Effective Natural Down Insulation That S Corralled Into Neat Diagonal Baffles For A Flattering Fit. Womens XS MICHAEL KORS Jacket Coat Green Long Puffer. Shipped with USPS Priority Mail. Color: eggplant with black faux fur collar (removable). 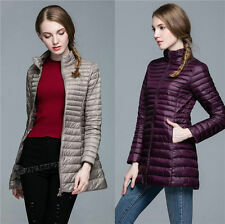 NEW Andrew Marc Women's Long Down Jacket Ladies Coat Choose Size and Color. Such an amazing coat for winter! Mackage coats are seriously warm, and don't sacrifice any style! Fill: 80% duck down, 20% feather. Removable hood, stand up collar, two front pockets, zipper and button closure. EMS Women's Long Down Parka Jacket Coat Black XS WATER REPELLENT NWT "Klawata"